The "barbed" wire fenced in field, is the genesis of the One hour idea that I broached with John Amato. 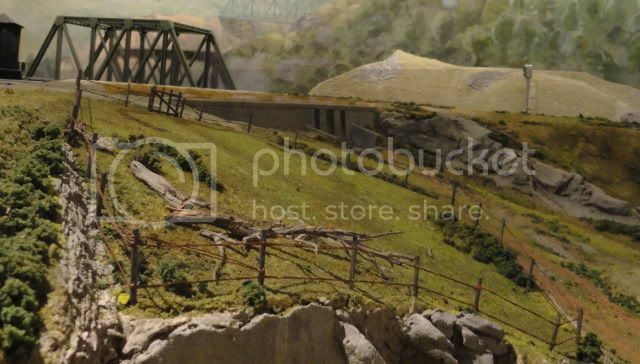 The "Barbed" wire idea came to me while I was actually applying the scenery material to this particular area of the layout. There was no preconceived notion about particulars. Once I decided that I liked the idea, I set about accomplishing the results. I had never even thought about making "barbed" before this project. The list of materials are as follows. I took the posts and simply dunked them in the India ink/alcohol solution and set them aside to dry. I took 2 lengths of thread and tied a knot in one end. I placed this end on a fixed object and then put the other end into a drill. I ran the drill until the threads had a fair amount of twist. I set the drill down, with tension on the thread and then painted the threads with the red primer and then the brown paint. Ran the drill only about half a revolution more so I could repeat the paint process on the threads that had not been covered with the first paint pass. I then made a gauge out of piece of scrap 1/4 MFD. The gauge did 4 things, it was used to determine the distance between posts(2"), the height of the posts about 3/4" and it was used to press the posts into the scenery structure. Next I made the gate using the same dowels as the actual fence posts, I simply cut the posts to length with wire cutters and glued it together. Using the gauge I then set the posts around the perimeter of the field. That done I then started attaching the now dried "barbed" wire using the gauge, for it's fourth use, help determine the height of the lower wire to the posts. After the lower wire was strung and without cutting it, I reversed direction and strung the upper wire. I then glued on the gate and placed in the dead fall. Thanks for posting the HOW TOO also.. Very nicely done! Being new to this great site I'm not sure if I can ask this, since you are limited to two pictures. Do you have any progress pictures, or a close up of the fence? Thanks for joining us, and thanks for asking Bob. It is fine to request more photos, I would only suggest to Aubv to please post them as a response to this topic, so that the original before and after shots can be easily seen as the first post at the top. Very nice, this one gets my vote, so little does so much in my opinion! Great work! Both the before and after scenes are very aesthetically pleasing. Congratulations on the 1 hour project win. Nice work. When I read this posting about barbed wire, I thought straight away about scale barbed wire that my 12yr old nephew came up with last year. This is the best picture I have of it. He made this out of a sheet of wire mesh, and simply cut our a single strand of the mesh. Doing so gave what looks just barb's at regular intervals. 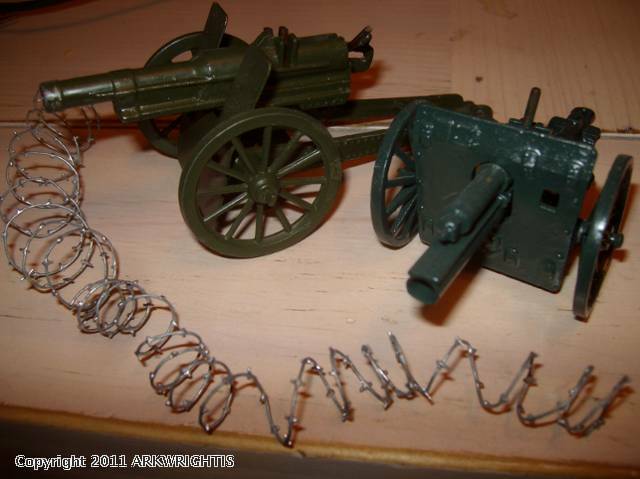 The wire was then wound round a piece of dowel and it quickly looked like barbed wire entanglements that you had in the 1st war, which is why its shown with these toy guns. It's ideal for O gauge and looks even better when sprayed rusty brown.